This report by Persistence Market Research (PMR) examines the ‘Cell free protein expression market for the period 2016–2024’. The primary objective of the report is to offer updates and information related to market opportunities in the Global Cell Free Protein Expression Market. The global cell free protein expression market report begins with an exhaustive executive summary giving the report data overview and the market taxonomy or segments covered in the report. It is followed by an overview of market dynamics of the global cell free protein expression market, which includes PMR analysis of key trends, drivers, restraints and opportunities, that is influencing the growth of the cell free protein expression market. It also includes an insight into pricing of the products. Impact analysis of key growth drivers and restraints based on a weighted average model have been included in the global cell free protein expression market report after detailed analysis of individual regions to better equip readers with meaningful insights on ongoing developments in the market. Based on product type, the market has been segmented into E. coli cell-free protein expression system, rabbit reticulocytes cell-free protein expression system, wheat germ cell-free protein expression system, insect cells cell-free protein expression system, mammalian cell-free protein expression system, and consumables (labelling tags, vectors). A detailed analysis has been provided for these segment in terms of market size, Y-o-Y growth rate, absolute $ opportunity, and BPS analysis. Mammalian cell-free protein expression system segment is expected to be the most lucrative segment in the cell free protein expression market owing to increasing applications of mammalian lysate in human drug discovery research. Based on application, the market has been segmented into enzyme engineering, protein labelling, protein-protein interaction, and protein purification. Our analysis predicts that the demand for protein-protein interaction studies would increase at a very fast pace contributing significantly to revenue generation over the forecast period. Further, based on end-user segmentation, contract research organizations and academic/research institutes are expected to remain the most promising market for cell free protein expression market during the forecast period. The next section of the report analyses cell free protein expression market by region and provides market outlook for 2016–2024. The report also analyses the impact of drivers and restraints in each region. Key regions assessed in this report include North America, Latin America, Europe, Asia Pacific (APAC), and Middle East & Africa (MEA). The above sections—by product type, application, expression mode, end users, and region—evaluate the present scenario and growth prospects of the global cell free protein expression market for 2016–2024. We have considered 2015 as the base year and provided data for the forecast period, i.e., 2016–2024. In the final section of the report on the global cell free protein expression market, ‘Competitive Landscape’ is included to provide report audiences with a dashboard view, based on categories of providers in the cell free protein expression market product portfolio and key differentiators. Key categories of providers covered in the report are cell free protein expression ready-to-use kits and reagents manufacturers. This section is primarily designed to provide clients with an objective and detailed comparative assessment of key providers specific to a market segment in the cell free protein expression market value chain and the potential players for the same. Report audiences can gain segment-specific vendor insights to identify and evaluate key competitors based on in-depth assessment of capabilities and successes in cell free protein expression market. Detailed profiles of the providers are also included in the scope of the report to evaluate their long- and short-term strategies, key offerings, SWOT analysis, and recent developments in the global cell free protein expression market. Key competitors covered in terms of manufacturers include Thermo Fisher Scientific, Takara Bio, Inc., New England Biolabs, Promega Corporation, CellFree Sciences Co., Ltd., biotechrabbit GmbH, Bioneer Corporation, Cube Biotech GmbH, Jena Bioscience GmbH, and GeneCopoeia, Inc.
To ascertain cell free protein expression market size, we have also considered revenue generated by major manufacturers. The forecast presented here assesses the total revenue by value and volume across the cell free protein expression market. In order to offer an accurate forecast, we started by sizing up the current market, which forms the basis of how the cell free protein expression market is expected to develop in the future. Given the characteristics of the market, we triangulated the outcome of three different types of analysis based on supply side, downstream industry demand, and the economic envelope. In addition, it is imperative to note that in an ever-fluctuating global economy, we not only conduct forecasts in terms of CAGR, but also analyse it based on key parameters such as year-on-year (Y-o-Y) growth rates to understand the predictability of the market, and to identify the right opportunities across the cell free protein expression market. The cell free protein expression market segments in terms of product type, application, expression mode, end users, and regions are analysed in terms of Basis Point Share (BPS) to understand individual segment’s relative contributions to market growth. This detailed level of information is important for identifying various key trends in the Cell free protein expression market. Another key feature of this report is the analysis of key segments in terms of absolute dollar opportunity. This is overlooked while forecasting the market. However, absolute dollar opportunity is critical for assessing the level of opportunity that a provider can look to achieve, as well as to identify potential resources from a sales and delivery perspective, in the global cell free protein expression market. 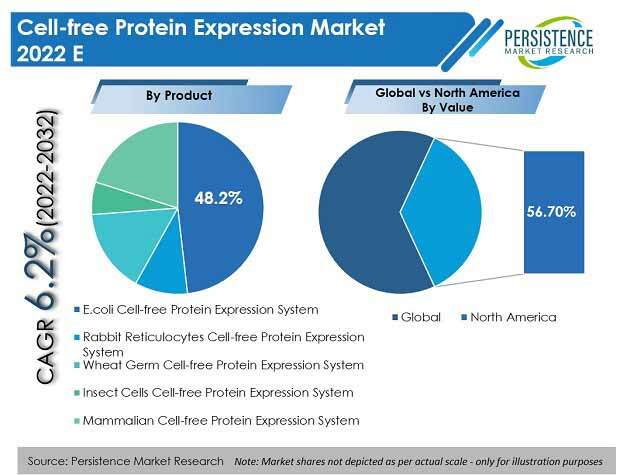 To understand key growth segments in terms of growth and adoption for cell free protein expression systems globally, Persistence Market Research developed the cell free protein expression market ‘Attractiveness Index’. The resulting index is expected to help providers identify real market opportunities. Cell-free protein expression (also known as in vitro translation, In vitro protein expression, cell-free translation, or cell-free protein synthesis) as the name suggests is the production of recombinant proteins in cell lysates rather than within cultured cells. Cell free protein expression uses the biomolecular machinery with all the components extracted from the desired cell type. Cell free protein production can be done using various kinds and species of cell lysates, and these methods have numerous benefits and features over traditional in vivo methods. The global cell free protein expression market has been segmented on the basis of product type, application, expression mode, end users, and regions. The global cell free protein expression market is projected to expand at a CAGR of 6.0% during the forecast period in terms of value. Global cell free protein expression market value is expected to increase to US$ 268.4 million by the end of 2024. Growth of the global cell free protein expression market is mainly driven by increasing R&D outsourcing by pharmaceutical and biotechnological companies, declining R&D productivity and patent cliff sales drop leading to increasing research intensity in the pharmaceutical sector and increasing expenditure on biosimilar development. Other factors driving cell free protein expression market are new and advanced applications, growing demand for simple and efficient protein production methods and rapid process/product development due to fewer steps. However, low protein production, high cost and short reaction scale, lack of eukaryotic co- and post-translational modifications and inability to carry out humanized glycosylation patterns, are expected to restrain growth of the market over the forecast period. Focus on novel approaches and development of fast, reliable and cost-effective methods for industrial scale production of proteins from cell lysates will define the future landscape of cell free protein expression market. Based on product type, the market has been segmented into E. coli cell-free protein expression system, rabbit reticulocytes cell-free protein expression system, wheat germ cell-free protein expression system, insect cells cell-free protein expression system, mammalian cell-free protein expression system, and consumables. Mammalian cell-free protein expression system segment is expected to be the most lucrative segment in the cell free protein expression market owing to increasing applications of mammalian cell lysate in human antibody development studies. Based on the major applications, the market has been segmented into enzyme engineering, protein labelling, protein-protein interaction, and protein purification. Protein-protein interaction segment currently accounts for the highest revenue of the cell free protein expression market owing to the robust research and development initiatives related to protein libraries generation. Based on expression mode, the cell free protein expression market is segmented into continuous flow expression and batch expression system. Continuous flow expression system is expected to account for the higher share for cell free protein expression market over the forecast period. Based on major end users, the cell free protein expression market is segmented into biotechnological companies, pharmaceutical companies, contract research organizations, and academic/research institutes. Academic/research institutes followed by contract research organizations are expected to account for the highest share for cell free protein expression market over the forecast period. Increasing outsourcing by pharmaceutical and biotechnological companies is expected to drive the cell free protein expression market in contract research organizations. The global cell free protein expression market has been segmented into five major regions: North America, Latin America, Europe, Asia Pacific (APAC), and Middle East & Africa (MEA). In terms of value, North America is estimated to be the dominant market for global cell free protein expression market in 2016 owing to robust research and development infrastructure. The Europe cell free protein expression market is expected to register a CAGR of 5.9% over the forecast period. Asia Pacific is estimated to be the fastest growing market in terms of CAGR. North America cell free protein expression market is expected to register a CAGR of 5.8% over the forecast period. Some key players in the global cell free protein expression market identified in this report are Thermo Fisher Scientific, Takara Bio, Inc., New England Biolabs, Promega Corporation, CellFree Sciences Co., Ltd., biotechrabbit GmbH, Bioneer Corporation, Cube Biotech GmbH, Jena Bioscience GmbH, and GeneCopoeia, Inc. The report also identifies company-specific strategies related to product development; market consolidation initiatives and analysis of their specific strengths, weaknesses, opportunities, and threats. Thermo Fisher Scientific is the leading providers of cell-free protein expression system accounting about 25% of market share in 2015. Promega Corporation is the second highest revenue generating company accounted for 14% revenue share in overall cell free protein expression market. Takara Bio, Inc. holds around 10% of market share in overall market. The company offers wide range of product under cell free protein expression category such as human cell-free protein expression system which is used in protein purification, protein labelling and high-throughput proteomic studies.